Kevin Chin is a seven-year veteran illustrator for the books and boxed games section of the Warhammer Studio. The interview is from the January 26 episode of Warhammer Live: In the studio and begins at 02:07:50. 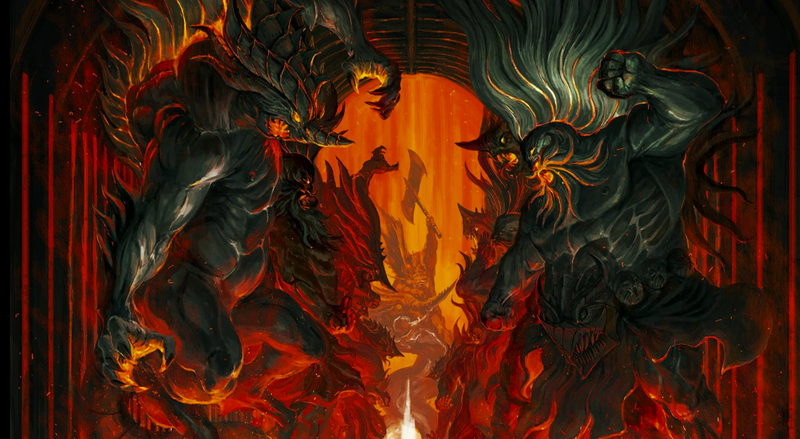 We being with a piece from Battletome: Everchosen depicting when Archaon conquers the All-gates and begins to build his fortress. Kevin says that he chose to complete this piece in black and white to evoke a sense of nostalgia to some of the original Warhammer artwork. The red background presents the two figures in an almost shadow puppet-esque manner and adds more emphasis to the legend of the story. As Kevin says, Archaon is the ultimate boogyman in the Age of Sigmar universe. Next up is a piece from Codex: Chaos Space Marines. Kevin worked closely with John Blanche on this one with the specific intent to get a sense of “what it looks like, what it means for an invasion to happen with Chaos…when Chaos Space Marines come in, they destroy everything”. Kevin drew inspiration from the work of John Martin, a Romantic-era English painter famous for depictions of biblical destruction. 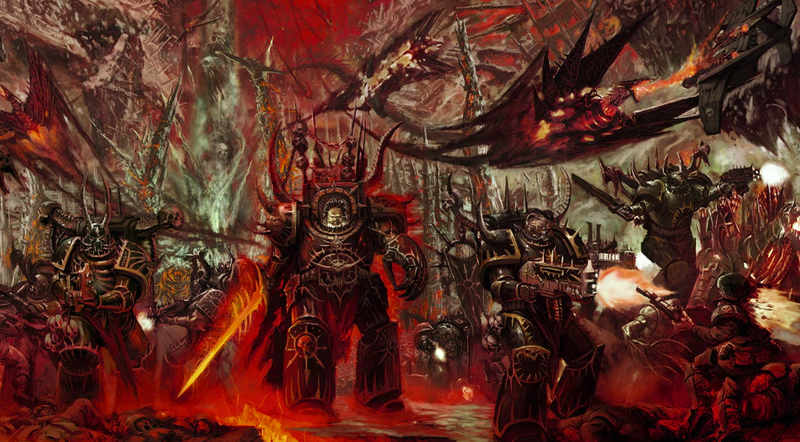 Every section of this piece is pure destruction and it captures the absolute contempt the Chaos Space Marines have for the Imperium as they stride forward without a moment of hesitation. Here we have a piece from the Warhammer 40,000 rulebook. This happens to be my favorite depiction of the Emperor of Mankind. 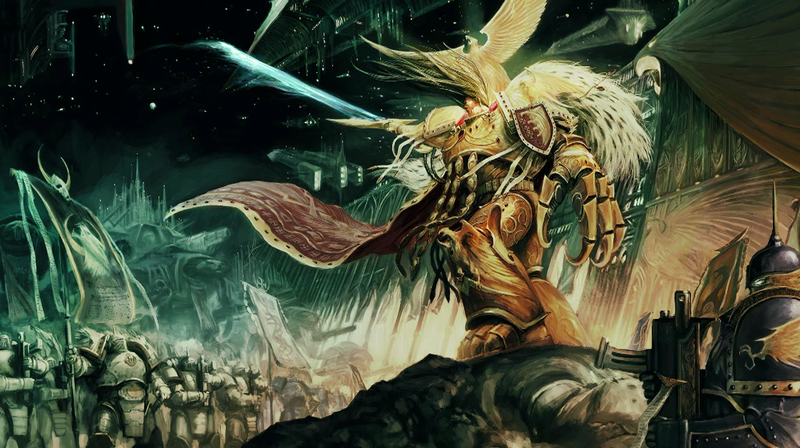 The theme is to “portray the Emperor at the peak of his power, the Imperium at the peak of its power, before the Horus Heresy kicks off, at the start of the Great Crusade to unite and liberate mankind”. Historically, this artwork shows the point just after Terra has been united and the Emperor is directing the legions to go forth and conquer the stars. 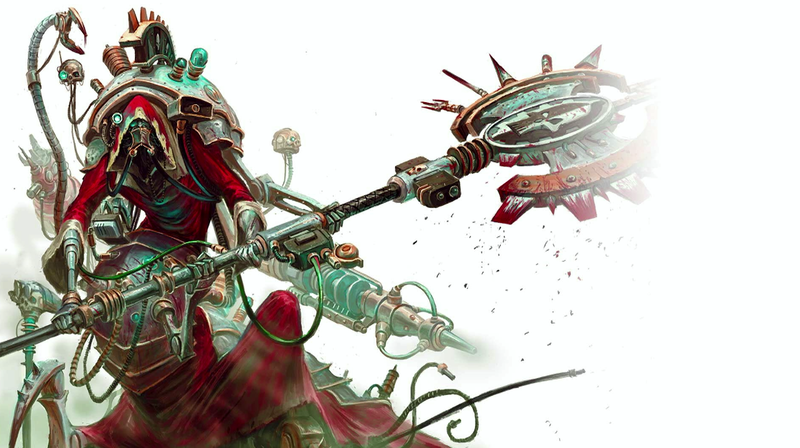 These are the vignettes of Belisarius Cawl, Inquisitor Greyfax and Saint Celestine. These are the three cards that were available during the launch of The Gathering Storm: Fall of Cadia. The interview only went into detail on Cawl and Kevin wanted to show a “very merciless side of him, blood dripping from his ax”. An interesting point, for this artwork Kevin had already seen the fully painted models and was tasked with bringing them to life. 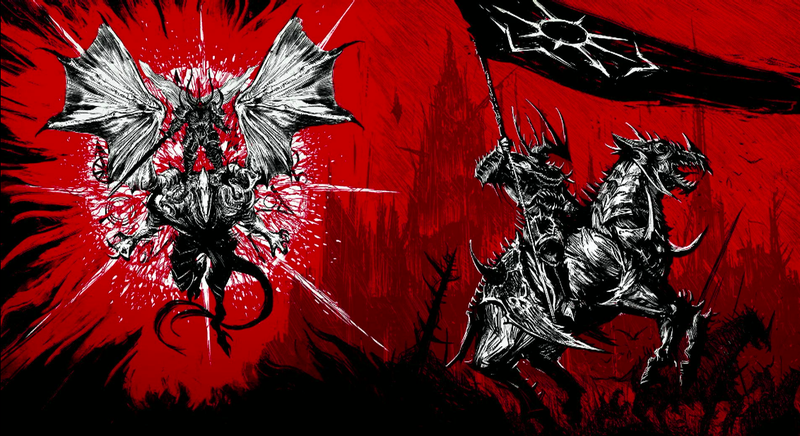 Now we have one of the first pieces of artwork released for the Age of Sigmar.Taken from the Time of Myth it depicts the battle between Grimnir and Vulcatrix, “a god fighting a god-beast”. What I did not realize the first time I say this artwork is the scale. Those are dragons in the foreground and they are the size of insects. And way down in the bottom right-hand corner there is a group of people praying up towards the sky as the gods battle. I have a new found appreciation for this artwork. Next is one from Battletome: Fyreslayers and shows the interior of a Fyreslayer lodge. Kevin wanted to recreate the “feeling of being judged” that one would feel upon entering a temple and focused on the sheer scale of the statues and the height of the temple ceiling. 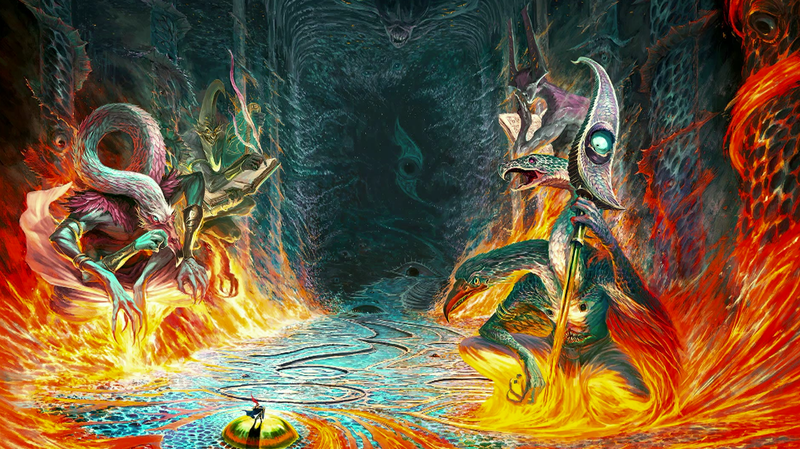 This piece shows the trial of a Fyreslayer who must ascend the steps of the temple to have the ur-gold hammered into him. Another one of my favorites from Warhammer Quest: Silver Tower shows what “happens when the first character shows up in the Siver Tower, and it’s absolutely bonkers”. I love the idea behind this artwork that shows these Chaos gods using the heroes as playthings, as pieces on a gameboard. Almost like they are taking bets on how the heroes will proceed in the Siver Tower. Something that I never noticed is the two dice on the hand of the two-headed beast in the front-left. A very interesting detail to add and it really sets the tone behind Silver Tower. 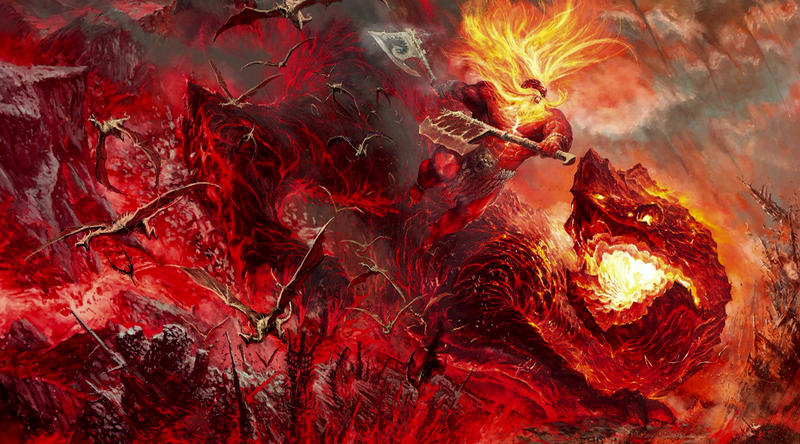 Kevin also admits that, in his opinion, Tzeentch is the most difficult to depict becasue of the colors. 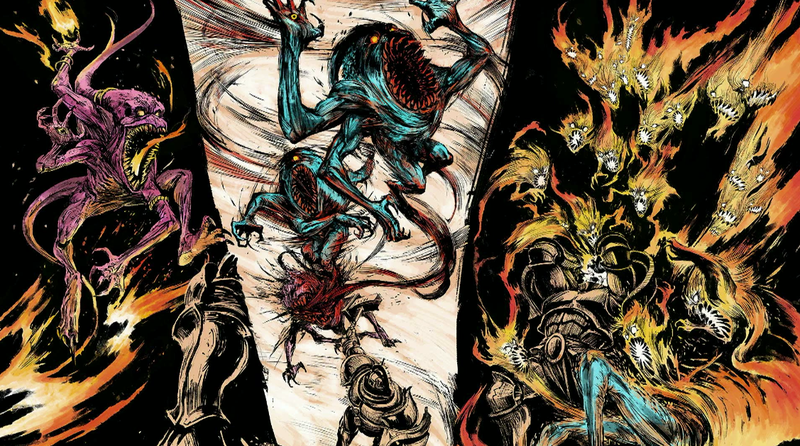 Here is a new piece from Battletone: Disciples of Tzeentch showing the three types of Horrors. Kevin wanted “to the transformation from the Pink Horror to the Blue, to the Brimstone Horrors and to do it as a story. One becomes two and two becomes many”. This artwork in particular evokes a dark fairytale feel and shows the change from one form to another in a violent way. Wow! I am floored with what the Warhammer Live team is doing. Thursday is quickly becoming my favorite day of the week because we get to not only see what new projects Games Workshop is working on but we get to talk to the people who create them. If you can, hop on the live stream and ask questions! When else will you get the chance to speak to the sculptors, the designers and the artists of the games we love? Warhammer Live is straight up killing it with content. If have not already, subscribe to the Warhammer TV Twitch channel and remember that you can get a free subscription to Warhammer TV if you are an Amazon Prime member with Twitch Prime. Don’t worry, you will still support Warhammer TV by using Twitch Prime.